Australian Immigration officials have conceded that more asylum seekers have arrived by boat since the budget than had been predicted, but they refused to be drawn on how much the extra numbers will cost taxpayers. The government says people smugglers are profiting by as much as $2 million for each vessel that arrives. The Coalition has seized on budget forecasts in May of 450 asylum seeker arrivals each month - a predicted total of 5400 for the financial year, which has already been eclipsed in the first three months starting in July. The arrival of almost 500 asylum seekers on five boats at the weekend underlined the pressure on border controls. Nearly 8000 people have arrived by boat since July. Labor's revised Pacific plan for Nauru and Papua New Guinea will accommodate about 2100 people, far fewer than the number who have arrived since August 13, when the policy was embraced. The Home Affairs Minister, Jason Clare, said people smugglers were making more money than some drug smugglers and they would fight hard to keep making money. People smugglers earned more than $1 million per boat and sometimes up to $2 million, he said. Immigration officials were questioned in parliamentary hearings yesterday about the surge in arrivals but deflected the potential cost to the budget, which Labor brought down with only a thin surplus. The Immigration Minister, Chris Bowen, denied offshore processing on Nauru, embraced by Labor in August after months of political stalemate over the people swap with Malaysia, had failed to deter arrivals. 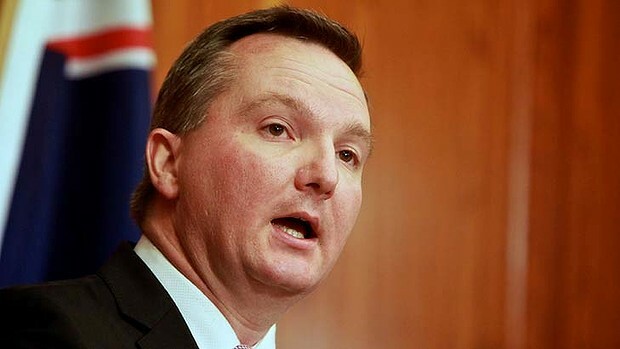 The Immigration Department chief, Martin Bowles, said the number of asylum seekers was higher than expected. He said the costs were a matter for the government to deal with in the midyear budget update. The Greens senator Sarah Hanson-Young asked officials who would bear responsibility for the psychological health of asylum seekers on Nauru.